Heavy Seas recently started selling multi-packs (like Flying Dog), and already a fan of Loose Cannon, I saw two Heavy Seas beers in the 12-pack that I hadn’t tried yet. And I was skeptical, because anything that says ‘citrix IPA’ – to my palate – has the potential to be gross. I don’t like fruity beer. 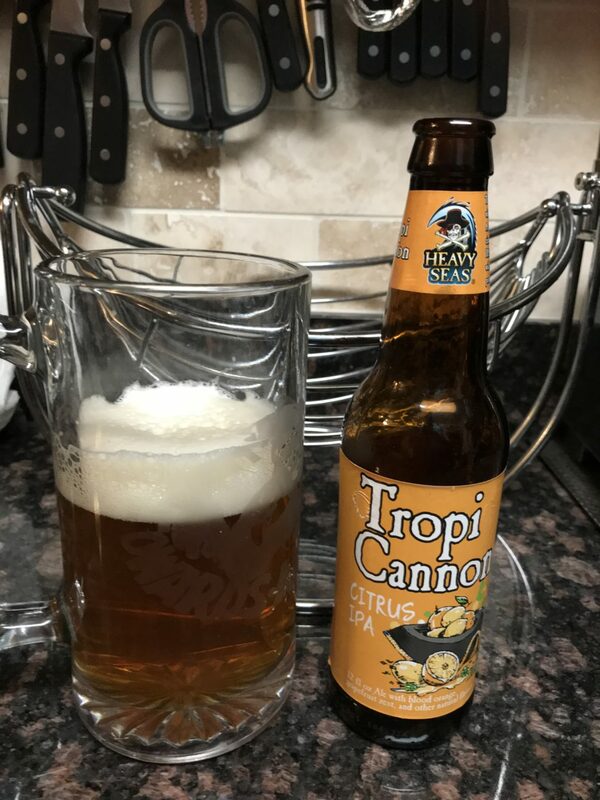 I don’t know how Heavy Seas did this but the citrus taste is definitely apparent in Tropi Cannon, but unlike other citrus IPA’s, or those New England IPAs, I’m not spitting it out. It goes down smoothly and I’m seriously about to grab a second one of these because I like it – not because I have two left and want to get rid of them. I’ll give this 4 stars though I’ll admit, like Loose Cannon and Double Cannon, I’ll probably only be buying this if it’s part of the multi-pack, as I enjoy other Heavy Seas too much to only stick with this one.